A miracle, according to the New Oxford English Dictionary, is a surprising and welcome event that is not explicable by natural or scientific laws and is therefore considered to be the work of a divine agency. With that definition, I’d have to say that William Wilberforce’s life was jam-packed with miracles. Left and right you can see divine influence, without too much assumption. The story of a man who had the guts to stand against all of the nastiest people in the country–in the world, really–wasn’t one of glamor, or glory. No, the hardships were extreme, and the consequences dear, but the results are still in effect. In an attempt to tell of two main miracles in William Wilberforce’s life, I’d have to start at the beginning. He was born into a moderately well-off family, and didn’t want for food or shelter. That leads to the first miracle: Wilberforce was very spoiled, because of his “societal class,” and he grew into a charming party animal. Friends with all, and well-practiced in the art of public speaking, he was geared for success in a life of politics. As he grew beyond childhood (making beyond ten being a miracle at that time in England) he was sent to his aunt and uncle’s home. They continued his upbringing, and he was converted, during his time with them, to a radical Methodist. At the time that was considered to be, well, radical. The “Methodists,” or “enthusiasts” as they were derisively dubbed, were scorned for their enthusiasm towards evangelical activities. They were considered uncouth by the elite of the culture and society. [Look up George Whitfield] This is miracle number two: Wilberforce, until this point, had lived rather frivolously, due to his significant monetary benefits. He was able to do anything he wanted, and he wanted to have a good time. He was smart but lacked direction. In this section of life God gave him direction. This helped Wilberforce realize the incredibly evil contrast between his life, and the lives of the slaves. Further into his life, Wilberforce has gained a reputation. He is a witty, charming, and kind politician fighting for the rights of all men, because all are equal. He’s proposed and passed bills to stop public burning, and has reduced the laws punishable by public hanging by nearly half and half again! He’s becoming quite accomplished, but he knows his work is nowhere near finished. Slavery is still rampant at this time. To properly frame the situation I have to explain a bit. When I say slavery, or racial injustice, you think of the Civil War maybe? The whites in the South? The Triple K? Or the Brown v. Board of Education case? Take all of those horrendous things and defenestrate them. Now think of the very worst racial injustice you’ve heard of and double, if not triple it. The process is disgusting. These slaves were stolen from their homeland of Africa and forced to lay horizontally stacked, one upon the other, until you couldn’t fit anymore because of the ceiling. Then, if they weren’t dead at the end of the trip, because of indescribable horrors, then they were taken to fields in America, or in any other colony that the British could use them at, to work until they broke, or died. It was a lucrative trade that many were loath to part with, but at it’s core it was evil, and many sensed that. Wilberforce fought for years upon years, and slowly chipped away at the massive institutionally accepted evil, and eventually gained some credence. Many of his friends laid their professional lives on the line for his cause, and helped him fight the slave trade. Eventually, after endless trials and underhanded schemes being thrown at them by large corporations (such as the British East India Company, which essentially governed India) Wilberforce prevailed, derailing what at the time was probably the most integral trade in the British Empire. To correlate everything, I’d like to point out that Wilberforce never would have been so empathetic with the slaves if he hadn’t become a radical Methodist when his mother sent him to his aunt’s. That event alone was life-changing, and -shaping. He was changed from the well-educated, charming ne’er-do-anything-of-import that he was, to a deep thinking and pious man. He also wouldn’t have been so self-condemning, if he hadn’t had his previous life as a well-to-do British elite. The implications are astounding, aren’t they? Let’s go step by step, taking a few liberties. God places Wilberforce into a rich family, Wilberforce grows; he learns academically–earning degrees necessary for a career in parliament–and personally–he develops his personality: wit, charm, and eloquence. Then, Wilberforce throws everything for a loop. He doesn’t have any ambition. Everyone likes him, and he just wants to enjoy life. God says, “No, you’ve got bigger things to do,” and sends him on his way to his Aunt’s by manipulating extenuating circumstances. Wilberforce becomes a Methodist, this leads to the cure of the world’s most deadly disease: slavery. 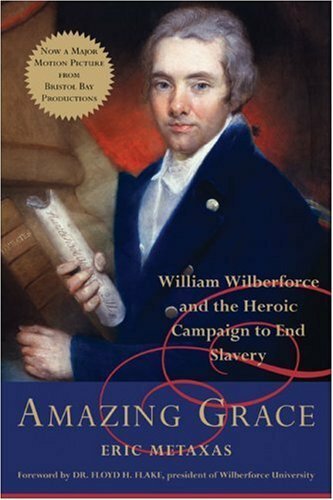 It’s amazing to see that through one man, God changed the world, taking in stride Wilberforce’s own decisions, and using them for the benefit of the world. That shows me, more than anything else, God will forgive any sin. Not only that, but he’ll use that sin to the benefit of you, your family, the world? The possibilities are endless. Luke 1:37, Luke 18:27.